With his project at the Cubo Garutti (Museion, Bozen/Bolzano) Hannes Egger brought together two very different institutions: the hotel and the museum. Thanks to its unique character as a detached branch of the Museion, the Piccolo Museion is a platform that offers an interesting perspective on the district it is located in. And given that there are no hotels there, the artist decided to create one. The resulting „Hotel Cubo“ gave visitors the chance to spend a night in both a museum and a work of art. 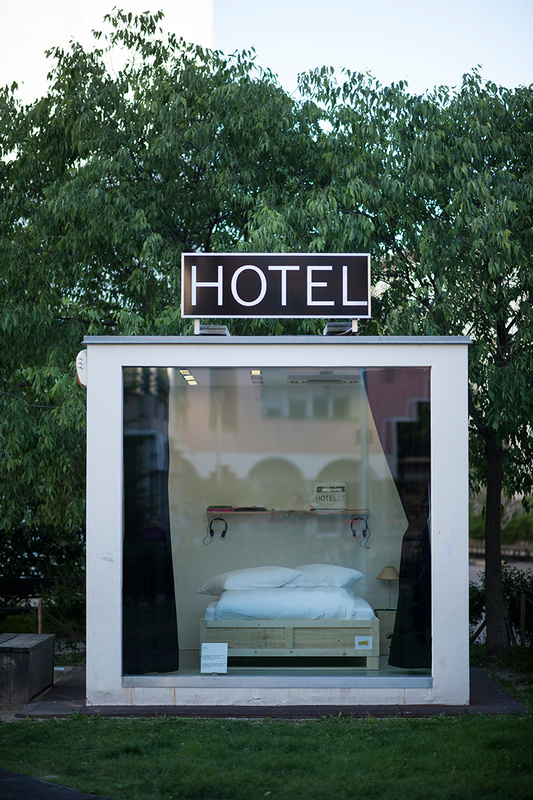 The Hotel was „opened“ for a maximum of two people who could stay one night and then explore the neighborhood the next morning with an audio guide created by the artist himself. The hotel was free, but all the normal reception procedures were respected, including check-in, check-out, a a courtesy kit, information service and safety instructions. The audio guide, in Italian and German, combined a special exhibition trail with a more conventional sightseeing tour of the city. The tour of the immediate neighborhood included stories and experiences that had been recounted by local people to the artist. Egger also designed a courtesy kit as a limited art edition, including a towel, a sleeping mask, a pair of slippers and a audio track from the audio guide. Through initiatives that often involve a kind of collective performance, like this one, Hannes Egger investigates the role of the museum and public art and the participation mechanisms triggered by art projects.